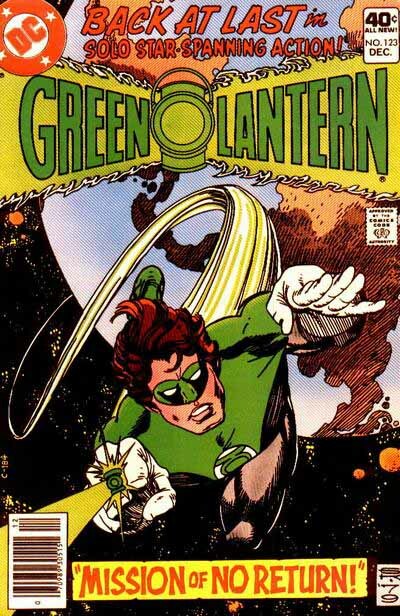 With issue 72 from Oct. 1969, the Silver Age Green Lantern began using this new logo created by Gaspar Saladino and Gil Kane. 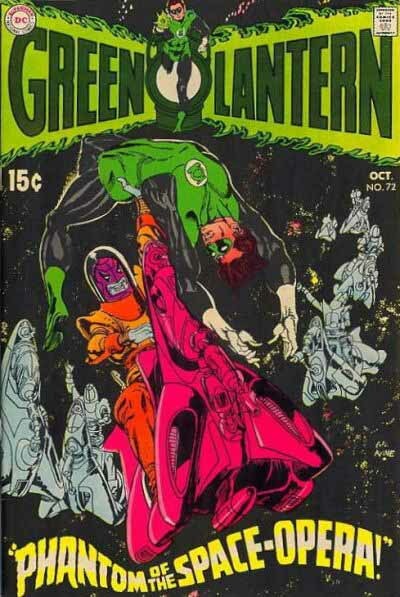 Kane did the lantern and GL figure, Gaspar did the GREEN LANTERN letters, and the flames as well. The letterforms are unmistakeably by Gaspar. Notice how, on the right side of each R the indent aligns with the bottom of the center horizontal stroke. Gaspar usually did his block letter R’s that way. The G is also distinctively his. For the figure, you need only compare it to the one on the cover right below to see it’s the same artist, and Gil was the primary GL artist at the time. Here’s the original logo from the DC files. 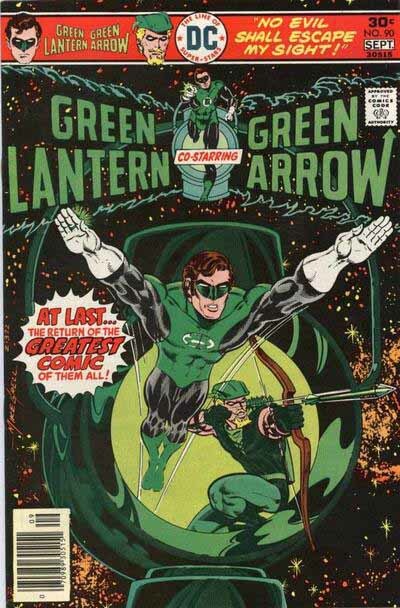 It’s been changed from that first cover appearance: the Green Lantern figure by Kane has been painted out so the lantern can be drawn complete. This logo was done on preprinted DC cover stock, and the top border and printer’s marks can be seen faintly at the top under a strip of white tape. The cover boards were apparently printed with the round DC symbol and Comics Code seal already on them, because these are also painted out with white paint and drawn over. Part of the left preprinted border remains, and Gaspar has used a section of the right preprinted border as the rightmost vertical line in the last N. Too bad the Kane figure is painted out here, but this version was needed a few years later, see below. I suspect the logo was laid out in pencil first because Gaspar has solved the uneven word length (GREEN is shorter than LANTERN) by wisely putting the lantern to the left of the center point, allowing the letters in both words to match in width and layout. 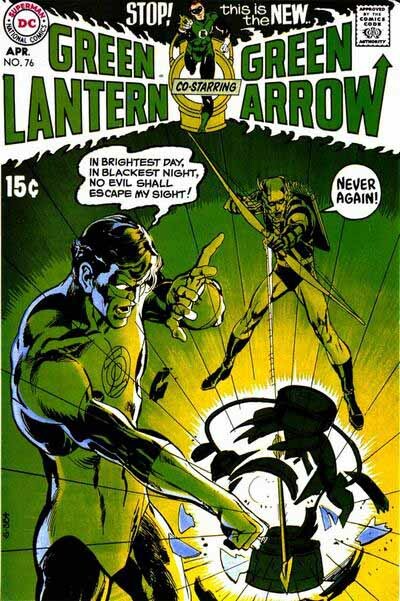 Then Gil Kane probably did the figure and lantern, and handed it back to Gaspar to ink the lettering and flames. This makes for a much better design solution than on the Golden Age version. The flames are more complex than Schnapp’s, and all lean to the left. They’re done with a wedge-tipped pen, giving the lines variable weight, which I think works nicely here. This is a fine logo, the only thing that bothers me a bit is the way GL’s legs are highlighted by the center of the lantern. It really makes Kane’s somewhat exaggerated leg structure stand out, and creates a distracting shape, to my eye. This logo didn’t stay for long, though. Issue 76 really threw readers a curve. “STOP! This is the NEW GREEN LANTERN co-starring GREEN ARROW,” as it says there, beginning the celebrated Denny O’Neil/Neal Adams run of stories. Gaspar Saladino did the revised letters here, as well, and don’t you love that arrow pointer on the end of the W? The layout has the two GREEN words a little smaller, leaving room for the rest of the trade dress, which all fits in snugly, though the lantern figure’s head did tend to get cropped off at the top. Despite the great stories and stunning art, this revamp never sold very well, and inexplicably was cancelled after about a year, the second time that happened to a Neal Adams project, the first being X-Men the year before. You can see why Neal stopped working as much on monthly comics, it must have been frustrating. story title, price, number and month all crammed in. Not an attractive layout to my eye. This version lasted for several years, often without the top banner, a better choice. 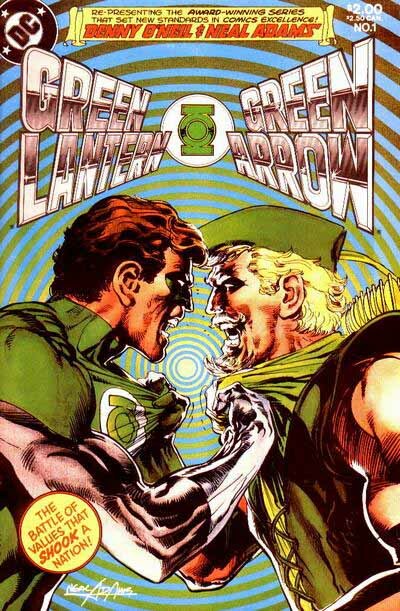 In 1983, about thirteen years after they first appeared, the O’Neil/Adams issues were reprinted in a series of seven quality offset issues, with new covers by Neal Adams, who also supplied this new logo. I’m not sure if Neal did it himself, but it came from his studio with the art. I think it’s a very attractive version of the original, with extreme perspective, beveled edges on the letters, and inking suggesting metallic shine. A few years later that sort of thing could be created much more realistically with computer color, but Neal did it pretty well with ink and graded color. All the covers on this reprint series were creatively interesting reworkings of his original covers. Back in the monthly title, a new creative team was taking over the book: writer Len Wein and artist Dave Gibbons, the beginning of the latter’s long association with the character. I believe Len was also the editor, and I remember working with him on a new version of the logo that began with this issue. Len wanted to keep the same basic design, but spruce it up a little. Here’s a better look at the logo as I drew it. The letters now have telescoping going off to each side and a metallic effect inside similar to the Neal Adams one above, but not as well done. I’m not sure if that was my idea or Len’s, but it certainly was influenced by the Adams logo. The other big change is that I did away with the flames (which had no logical reason to be there) and replaced them with an overly complex burst, radiating away from the center. I went overboard on it, it should have been simpler, but the worst part is the double outline, which is too close together. I should have stuck with a single burst, as on the lantern. Ah, well. Len and Dave seemed to like it anyway. 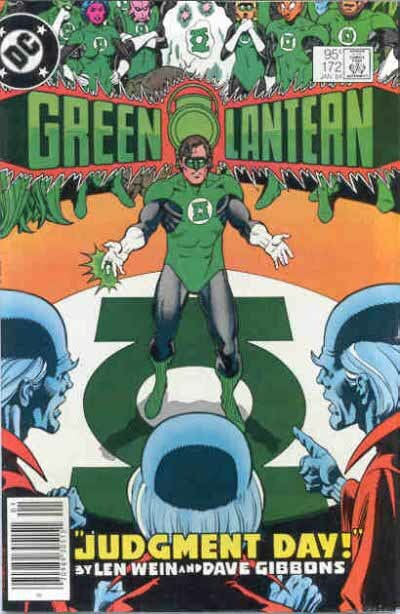 It stayed on the cover through and beyond their run, until the popularity of the Green Lantern Corps as a whole prompted a new direction and a new logo for the series. This entry was posted in Logo Studies on November 14, 2007 by Todd. Thanks for another great installment but that last logo, you say you did away with the flames? It looks like they’re still there to me (moreso even, with them now encompassing the lantern), or is the effect meant to be a starburst? Martin, flames have little curls and scallops, I did an energy burst instead. Okay, it’s a subtle difference, but if you compare previous logos to mine, you’ll see what I mean. While I like the stuff Gaspar & Kane did, the green flames in the logo didn’t make much sense design-wise. I think the energy burst works better, although I’m not sure if I still like the thicker letters or not. I guess for the time period they work fairly well.